Açaí (ah-sigh-EE) berry comes from the açaí palm, and it is cultivated in the Brazilian Amazon. The fruit is a dark purple drupe, and it’s about one inch in circumference. It is small, round, and is produced in the branches of the açaí palm. It has a single large seed in it that covers 80% of the fruit. The fruit is harvested only twice a year. Açaí has various antioxidants, bring numerous health benefits, and there has been laboratory testing done to prove it. The many benefits of the açaí berries are the main reasons that this fruit is considered a superfood. Açaí brings many benefits when you are consuming them on a regular basis. It has been named a superfood due to its various, lab tested, health benefits. Açaí berries are extremely rich in antioxidants which are extremely beneficial to add to your diet. Adding Açaí berries regularly to your diet will help you prevent many ailments by becoming resistant to harmful organisms which boost your overall health. It helps improve blood circulation by relaxing the blood vessels, lower cholesterol, and promote skin health as well instead of using harsh chemicals. Açaí berries are extremely high in essential fatty acids, Omega 3, Omega 6 and Omega 9, which are good types of fatty acids for you. Açaí is a rich source of calcium, iron, vitamins B1, B2, B3, C, E, potassium, fibers, and proteins. Açaí berries provide you with a boost of energy and stamina. Athletes love to take advantage of its health benefits along with its natural increase of energy. It helps to combat exhaustion as well as fatigue. Açaí berres are extremely high in antioxidants. Antioxidants can slow or even reverse the aging process that is caused by oxidative damage. Açaí berries are one of the world’s highest sources of antioxidants. It has two times the amount of antioxidants as blueberries and ten times the amount as grapes. Among all other nutrients açaí is extremely high in Vitamin C, and it also has ellagic acid. This combination can help you severely boost your immune system. It is hard to deal with respiratory distress, as it can cause a lot of problems. As soon as you take açaí it can actually help you to start feeling better immediately, and that boost of energy will help as well. It helps to get you through the day and keep your irritation that’s related to respiratory distress at bay. Açaí berries help your digestive system helping keep it clean and making you feel better. It helps detox your body and it has a lot of dietary fiber. Though, it isn’t extremely high in fiber and you will find that many other fruits have it as well. Many people compare açaí berries to red wine, as it can also help your heart. Açaí berries are rich in antioxidants, especially high in anthocyanin – this is a type of antioxidant that can help to lower cholesterol over time. It can even prevent blood clots. It has cardio-protective benefits that are beneficial to our cells. It even improves blood circulation overall. Since açaí berries are known as a superfood it will help you to lose weight and maintain weight, so long as you take it regularly. It helps negate effects from a high-fat diet, and actual tests have been run in and out of the laboratory. Açaí berries have been used for a long time, and they are important to keeping a healthy weight and a healthy body. Our organic açaí berries are sustainably grown from the Brazilian Amazon. They are harvested and freshly frozen within hours to preserve the potent health benefits and to maintain its nutritional value when consumed just as if you were in the Amazon. 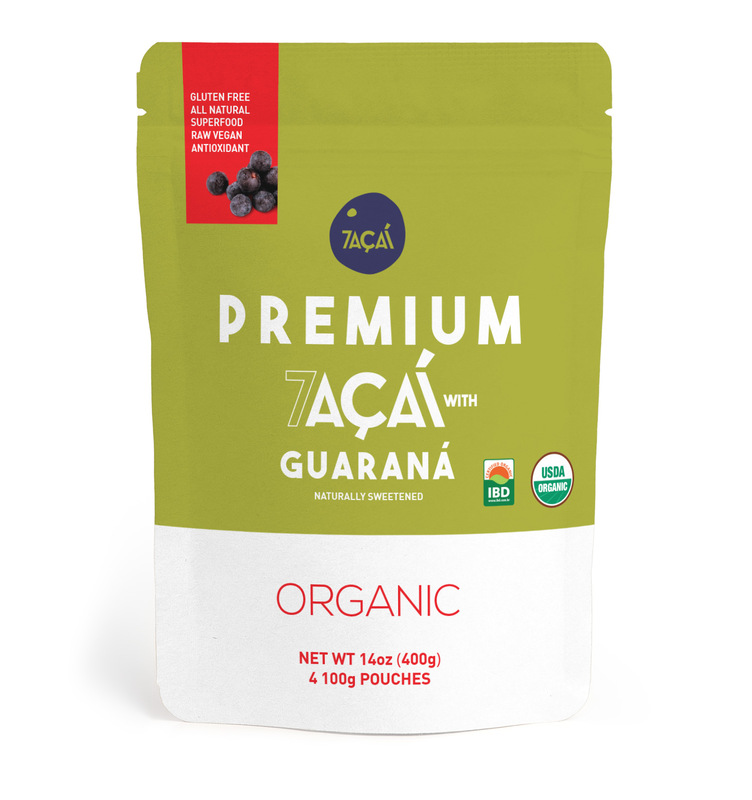 With many vitamins in its composition, açaí is a superfood considered important for the health of human beings due to containing several useful vitamin composts. Açaí has extraordinary energetic properties, so that it has become one of the favorite foods of athletes and fans of staying fit & good health.